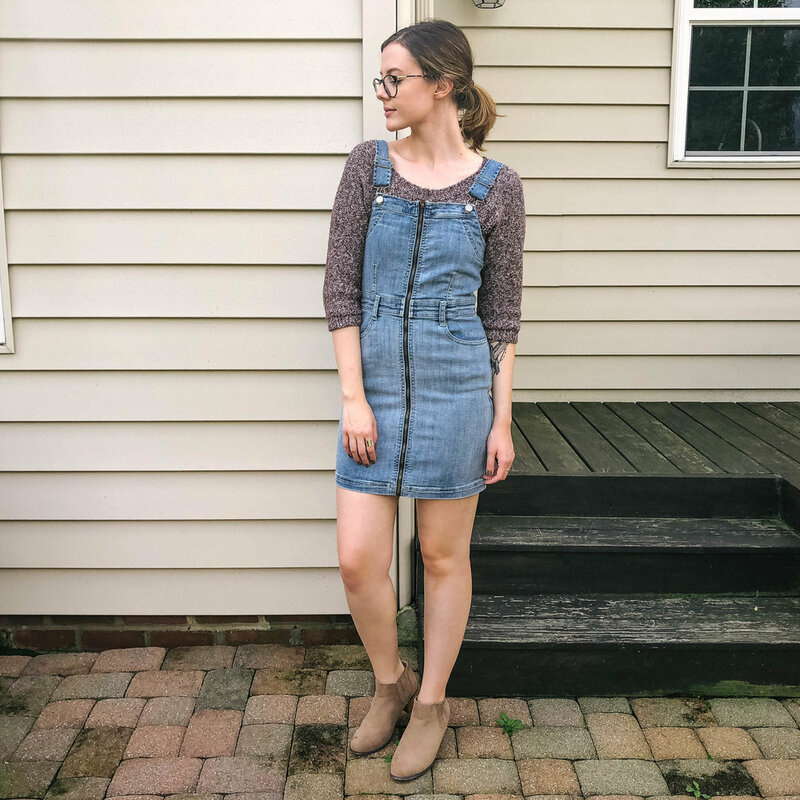 In honor of fall officially arriving , here are some of my favorite outfits I've wrangled up from my closet for this beautiful season. Anyone else get way too pumped about fall? Like more than Christmas season? Just me? Okay that's what I thought. I love the combination of these chunky-heeled boots and the button up skirt. This outfit was inspired by every outfit I have pinned on my Pinterest “Dream Closet” board because they all look exactly the same. Nothing wrong with that. I’m a simple woman. A tip I like to reference myself to when you have an accent piece that’s “oversized” (like this jacket): Make sure you balance out your outfit. There is a fine line between looking trendy and looking like a literal baggy garbage bag. If you wear baggy jeans or joggers, a baggy t-shirt, and an oversized sweater or jacket…you’ll look like you’re swimming in your clothes. I used these camo pants to complement the jacket and direct attention to the more “form fitting” aspect of the ensemble. Nothing like wearing a season-appropriate dress in the fall! This beauty is from Roolee.com (store is located in Utah I believe), booties are from StitchFix, and necklace is from Charming Charlie (props to my Dad for picking it out for me). Also, that’s my favorite candle in the whole world - Marshmallow Fireside from Bath and Body Works. You really have to know your body shape in order to find a dress that you never want to take off. Everyone is shaped differently, therefore the dress on the model won’t look the same as the dress on you. For me, I love A-line dresses (ones that are form-fitting toward the top, hit at the waist and fall to the bottom), that stop below the knees. I am pear-shaped, (tiny top, wider bottom). Longer dresses just work better for me, especially in regards to comfort. My advice to you: Wear what you love and what you feel comfortable in! My most recent purchase are these cute (and incredibly comfortable), coveralls! I purchased this beauty at American Eagle as well as the mauve, floral top. Best clearance-rack finds ever! The booties were given to me as a gift, and the sweater featured in the second photo was also given to me as a gift a long time ago (Target maybe?) Anywho... the main focus of this look is the coverall! Black jeans and a grey t-shirt didn’t seem important at the time of taking this photo. I really wanted to show off my beautiful plaid scarf with this dual-fabric, army-green jacket. This scarf is from Amazon, and I believe this jacket is from Marshall’s but don’t quote me on that because I’ve had it for a while. This jacket is so unique. It’s mostly a soft, faux leather, BUT it drapes down in the front and really flatters us curvy gals. Lastly (and most cozily) is this thrifted sweater (seriously y’all need to go thrifting, you can always find a great sweater…or two or three…), leggings from Target, and socks from H&M! So cozy, I’m ready to snuggle up next to a fire with my dogs and watch John Hughes movies until I die.